Dr. Edward C. Mader Jr. is an Associate Professor of Neurology at the Louisiana State University Health Sciences Center (LSUHSC) in New Orleans, Louisiana. He is a diplomate of the American Board of Psychiatry and Neurology (ABPN) in the specialty of neurology and in the subspecialties of clinical neurophysiology and sleep medicine. He is also a diplomate of the American Board of Sleep Medicine (ABSM). Dr. Mader is the Associate Medical Director of the University Hospital Clinical Neurophysiology and Sleep Laboratories and is a staff epileptologist of the LSUHSC Epilepsy Center of Excellence. Dr. Mader obtained his medical degree from the University of the Philippines in Manila. He completed his internship and neurology residency at the Pennsylvania State University. 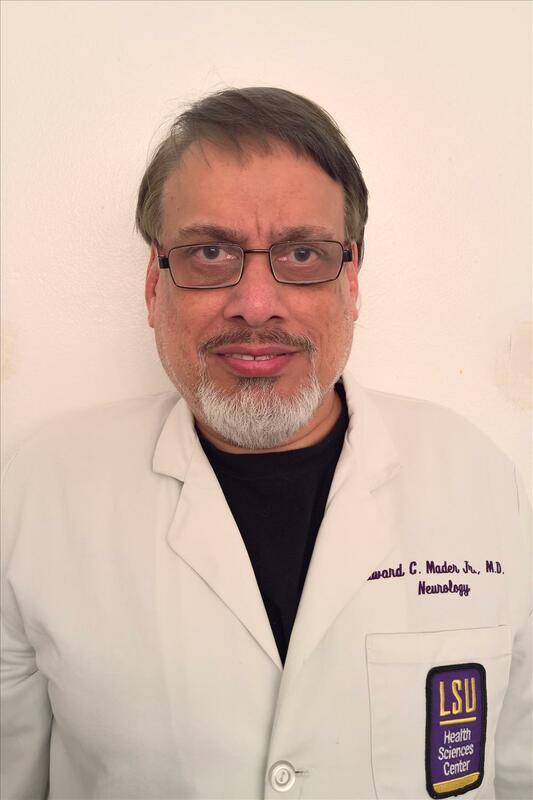 He underwent three years of fellowship training in clinical neurophysiology, epilepsy, and sleep medicine at the LSU Medical Center in New Orleans, the institution where he is now a faculty member. Teaching residents and fellows is regarded by Dr. Mader as the most gratifying aspect of his career. He also has a keen interest in research and is author of several peer-reviewed articles, abstracts, reviews and textbook chapters. Currently, his primary research interest is computer-based analysis of normal and abnormal electrical signals generated by the brain. He is also involved in clinical trials of new anti-epileptic drugs and medical devices. Dr. Mader is currently a member of the American Epilepsy Society (AES), the American Clinical Neurophysiology Society (ACNS), the American Academy of Sleep Medicine (AASM), the American Academy of Neurology (AAN) and the New Orleans Neurological Society. Mader EC Jr, Miller D, Toler JM, Olejniczak PW. Focal Epileptiform Discharges Can Mimic Electrode Artifacts When Recorded on the Scalp Near a Skull Defect. J Investig Med High Impact Case Rep. 2018 Aug 21; 6:2324709618795305. Mader EC Jr, Cannizzaro LA, Williams F J, Saurabh L, Olejniczak PW. Periodic lateralized epileptiform discharges can survive anesthesia and result in asymmetric drug-induced burst suppression. Neurol Int. 2017; 9:6933. Lambert SL, Williams FJ, Oganisyan ZZ, Branch LA, Mader EC Jr. Fetal-type variants of the posterior cerebral artery and concurrent infarction in the major arterial territories of the cerebral hemisphere. J Investig Med High Impact Case Rep. 2016. Jul-Sep: 1-7. Mader EC Jr, Mader ACL. Sleep as spatiotemporal integration of biological processes that evolved to periodically reinforce neurodynamic and metabolic homeostasis: The 2m3d paradigm of sleep. J Neurol Sci. 2016 Aug 15; 367:63-80. Mader EC Jr, Richeh W, Ochoa JM, Sullivan LL, Gutierrez AN, Lovera JF. Tumefactive multiple sclerosis and hepatitis C virus 2a/2C infection: Dual benefit of long-term interferon beta-1a therapy? J Neurol Sci. 2015 Feb 15; 349(1-2):239-242. Mader EC Jr, Villemarette-Pittman NR, Rogers CT, Torres-Delgado F, Olejniczak PW, England JD. Unihemispheric burst suppression. Neurol Int. 2014 Aug 13;6(3):5487. Mader Jr., E.C., El-Abassi, R., Villemarette-Pittman, N.R., Santana-Gould, L., Olejniczak, P.W. & England, J.D. Sporadic Creutzfeldt-Jakob disease with focal findings: Caveats to current diagnostic criteria. Neurology International 2013 Feb 15;5(1):e1. Mader EC Jr, Maury JS, Santana-Gould L, Craver RD, El-Abassi R, Segura-Palacios E, Sumner AJ. Human rabies with initial manifestations that mimic acute brachial neuritis and Guillain-Barré syndrome. Clin Med Insights Case Rep. 2012;5:49-55. Mader EC Jr, Olejniczak PW. Chapter 10, “Epilepsy Syndromes” in Epilepsy and Intensive Care Monitoring: Principles and Practice. Ed. Bruce J. Fisch. Demos Publishing, 2010; 10:119-150.